Remember that time long ago, last week, when I made my Baked Tofu Bites? I wasn’t lying when I said I was obsessed with them and make them constantly. Now, I promise not to post only baked tofu bites recipes from now on, but I had to post at least one more to celebrate their deliciousness. 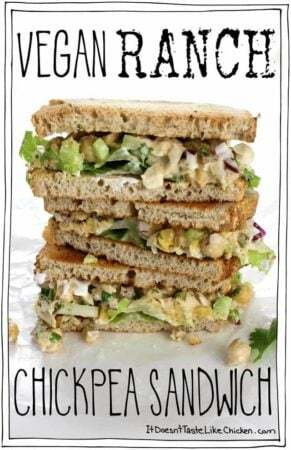 My favourite way to devour tofu bites as of recent is in this awesome hearty vegan tofu salad sandwich. 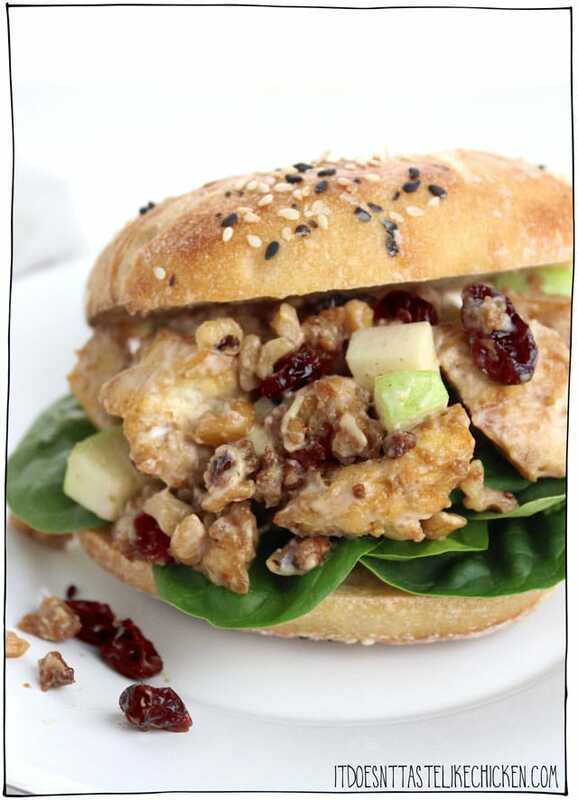 The tofu bites are combined with tart granny smith apple, crunchy walnuts, and sweet dried cranberries, all mixed together with creamy vegan mayo and a little pop of Dijon mustard, oh baby. Then just toast a bagel (or any other kind of bread that you prefer) and layer on the sandwich filling nice and thick. Initiate drooling sequence. Hand out napkins. So hearty, so satisfying, chomp on. The hearty tofu salad sandwich filling keeps well for a few days when made ahead and stored in an air-tight container in the fridge. Perfect for packing it up to take to work or to school. 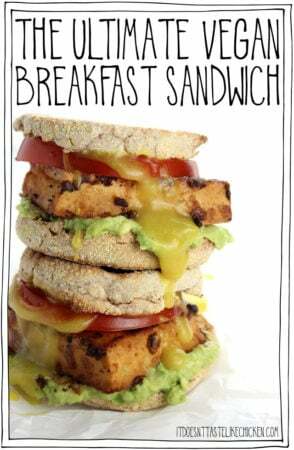 To make this Hearty Vegan Tofu Salad Sandwich: first prepare the Baked Tofu Bites according to the directions. They can be made ahead of time if you like. 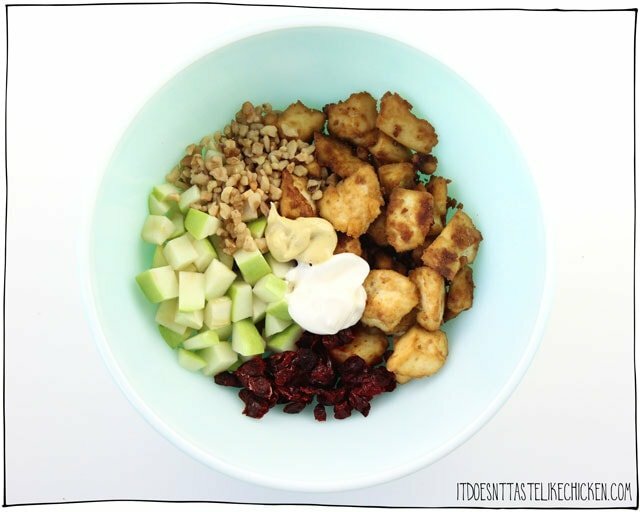 Add the Baked Tofu Bites along with the granny smith apple, chopped walnuts, dried cranberries, vegan mayonnaise and dijon mustard to a medium bowl. 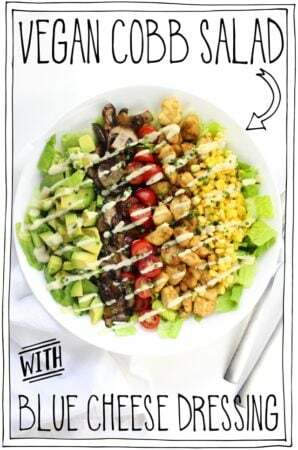 These days store-bought vegan mayonnaise are easily available in most grocery stores or online, but if you want to make your own I have a recipe in my cookbook which is always my go-to. Serve by loading up a bagel (or bread of choice) with the tofu salad. Store any leftover salad in an air-tight container in the fridge. It’s great prepared ahead of time making it perfect for an easy packable lunch or make-ahead meal. 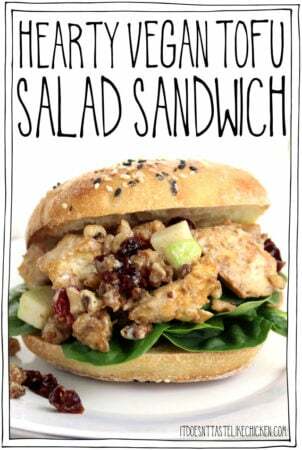 With granny smith apple, dried cranberries, walnuts, and baked tofu bites mixed with vegan mayonnaise and dijon mustard. The perfect make-ahead sandwich for work or school. Prepare the Baked Tofu Bites according to the directions. They can be made ahead of time if you like. 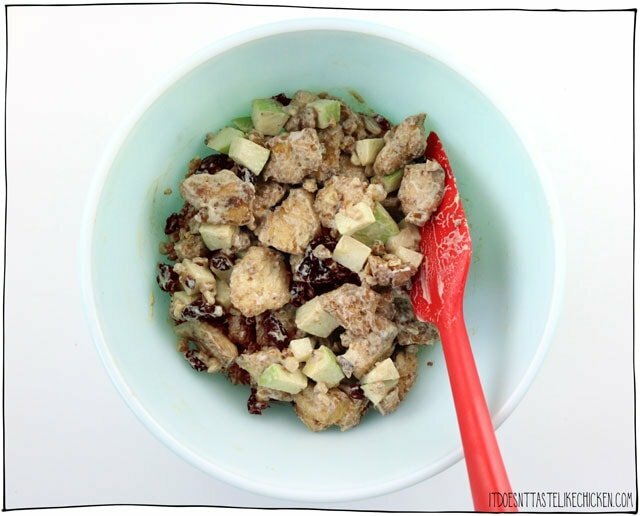 Add the Baked Tofu Bites along with the granny smith apple, chopped walnuts, dried cranberries, vegan mayonnaise and dijon mustard to a medium bowl. Mix well to combine. Serve by loading up a bagel (or bread of choice) with the tofu salad. Store any leftover salad in an air-tight container in the fridge. It's great prepared ahead of time making it perfect for an easy packable lunch or make-ahead meal. 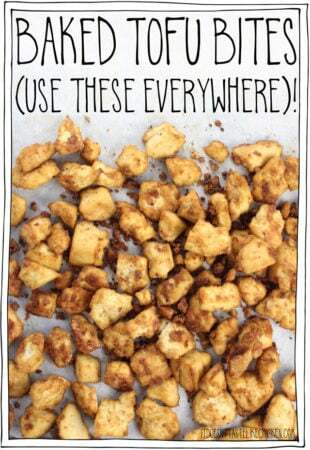 Previous Post: « Baked Tofu Bites (Use These Everywhere)! This is delicious! Your tofu bites are so versatile. Another home run! Plan to take this to a work potluck. I love shocking people with recipes that are truly mouthwatering AND healthy. Your site as an absolute go-to for me. Thanks! When I say I’m obsessed with this recipe, I’m not joking – it makes it into my lunch box every week! I put the mix in a wrap for easier transport and it’s perfect. This was very delicious and satisfying. 10/10! Thanks for another winner. Fast, easy, and really satisfying – was our perfect weeknight dinner today. 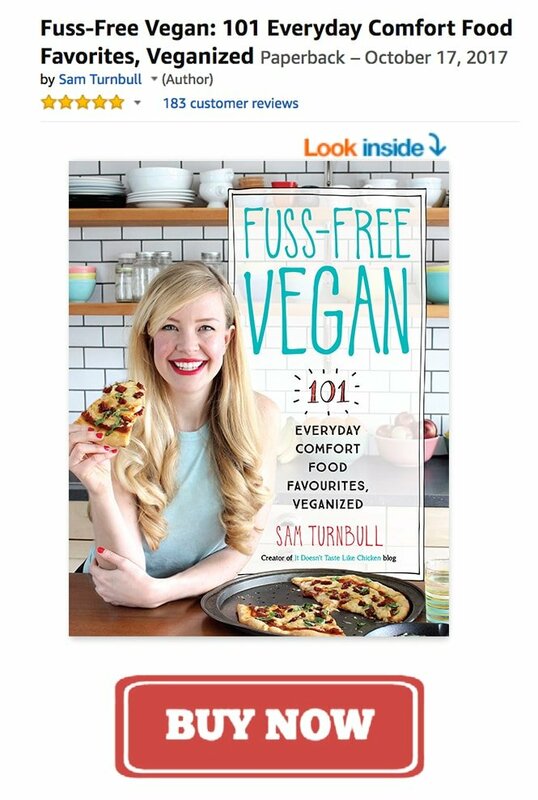 Please publish another cookbook soon, I promise to buy it (and recommend it to others) right away . My tummy was just happier than it has been in a long while. This is simply fabulous. The tofu bites tasted like fried chicken when I pulled them out of the oven yesterday, but today’s assembled salad between slices of lightly toasted sourdough bread was divine. Thank you! This tofu salad made delicious Thanksgiving crostinis. I served a good helping on thin slices of baguette topped with a fried, lightly-salted sage leaf. Big hit at our family Thanksgiving dinner! 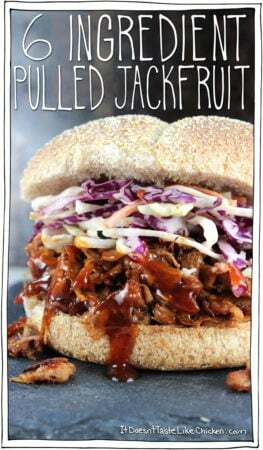 Thanks again for another great recipe, Sam! This is delicious! Like the first post-Thanksgiving sandwich, without the turkey. It’s tasty, with a nice variety of textures and sweet/savory flavors. The baked tofu on its own is outstanding — really savory and flavorful. That could be major pig out food — just standing over the stove picking chunks of baked tofu off the baking sheet. Yum! Thanks for sharing. On my!!!! That sounds wonderful!!!! I bought a pkg of extra firm tofu knowing that the right recipe would just…. arrive and this is it! 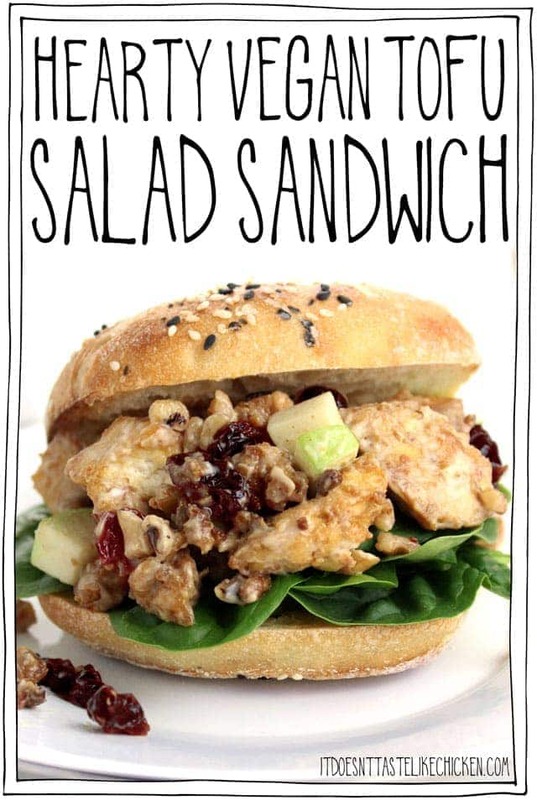 This will be my lunch tomorrow and Tuesday… I love cranberries walnuts and apple together. Just bought my favourite bread too. Thanks Sam! You’re welcome, Ali!! So glad your tofu instincts were right! This looks GREAT!! As a variation of a classic Waldorf salad, I think I will substitute a head of chopped Romaine and serve as a salad. I am going to make a big batch of tofu bites today and divide up to use in a Waldorf salad one day and a “chicken” curry salad on another day. I LOVE that you can use your recipes in multiple ways. 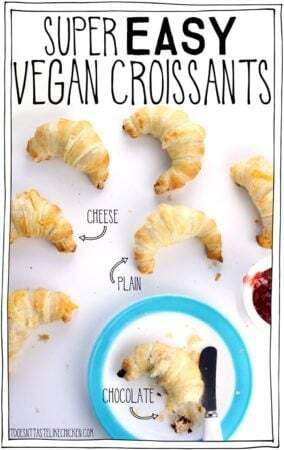 I am trying to help someone as they start to veganize their life, and showing them how to make one thing that can be used multiple ways for lunch is a HUGE help. That looks so good! 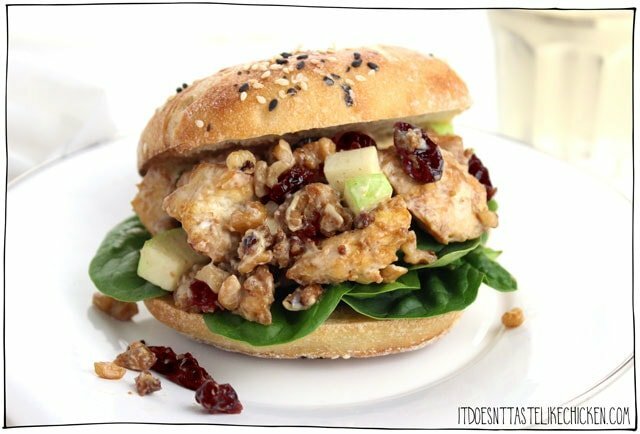 I’ve never thought to add chopped apple to “chicken” salad, but I definitely want to give it a try now!